In the World Library of Psychologists series, international experts present themselves career-long collections of what they judge to be their finest pieces - extracts from books, key articles, salient research findings, and their major theoretical and practical contributions. 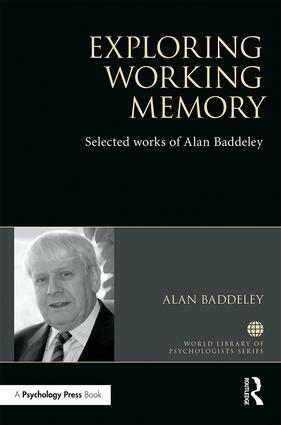 Alan Baddeley has an international reputation as an eminent scholar and pioneer in the field of human memory, and is principally known for the theory of working memory, devised with Graham Hitch. This model continues to be valuable today in recognising the functions of short-term memory. This volume includes a specially written introduction by Alan Baddeley which gives an overview of the start of his career and his entry into the field of Psychology. Throughout the book he also provides introductions to the selection of works included and contextualises them in relation to changes in the field during this time. Exploring Working Memory includes the author’s most influential publications on topics including short-term memory, the distinctions between short and long-term memory, the theory of working memory, the phonological loop, the concept of the central executive, and the episodic buffer. This exceptional selection concludes with an article giving a broad overview of the author’s current views on working memory and its relation to other theories in the field. Through his outstanding work Alan Baddeley has become known as a world-leading expert on human memory. Exploring Working Memory is a unique collection which will be of great interest to both students and researchers interested in human memory from psychology backgrounds. Alan Baddeley is Professor of Psychology at the University of York and one of the world's leading authorities on Human Memory. He is celebrated for devising the ground-breaking and highly influential working memory model with Graham Hitch in the early 1970s, a model which still proves valuable today in recognising the functions of short-term memory. He was awarded a CBE for his contributions to the study of memory, is a Fellow of the Royal Society, the British Academy, the Academy of Medical Sciences, and the American Academy of Arts and Sciences. In 2012 he received the BPS Research Board’s Lifetime Achievement Award and in 2016 the International Union of Psychological Sciences Award for Major Advancement in Psychological Science.